The main difference between thick and thin skin is that thick skin is hairless and consists of a thick epidermis whereas thin skin contains hairs and its thickness varies based on the thickness of the dermis. Furthermore, thick skin exclusively occurs on the soles of feet, palms of hands, and the surface lining of the fingers and toes while thin skin covers the rest of the body. Thick and thin skin are two types of skin present in the body. The main function of the skin is to protect the body from dehydration, pathogens, and mechanical damages. Thick skin is the skin with a thick epidermis. The thickness of the skin varies from 0.6 to 4.5 mm; it is also known as six times thick than the regular skin of the body. Generally, this type of skin occurs on the soles of feet, palms of hands, and surface lining of the fingers and toes. Moreover, thick skin contains five layers in the epidermis. But, regular skin contains four layers in the epidermis: stratum corneum (keratinized squames layer), stratum granulosum (granule cell layer), stratum spinosum (prickle cell layer), and the stratum basale (basal cell layer). The additional layer of the epidermis in the thick skin is stratum lucidum, which is a thin transparent layer between the stratum basale and stratum corneum layer. Furthermore, the main function of the thick skin is to protect these areas from continuous mechanical abrasion. Also, thick skin lacks hair follicles, smooth muscles, and sebaceous glands. However, it contains a number of sweat glands as well as ridges and furrows on the surface. Thin skin is the skin with a thin epidermis. 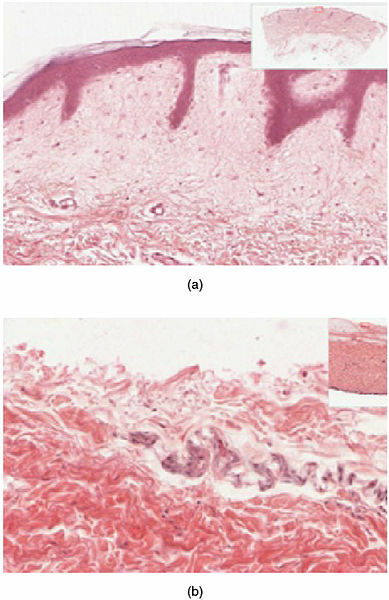 The thickness of the epidermis of this type of skin varies from 0.1 to 0.15 mm. Also, most of the body is covered with thin skin. This type of skin only contains four layers in their epidermis and it lacks a stratum lucidum layer. In addition, its stratum spinosum and stratum corneum layers are thinner. Moreover, one of the main features of thin skin is the presence of hair follicles. It also contains small muscles attached to hair follicles known as arrector pili muscles. They are responsible for standing hair on ends. On the other hand, this skin contains sebaceous glands. The main function of the thin skin is to protect the body from dehydration and pathogenic attack. 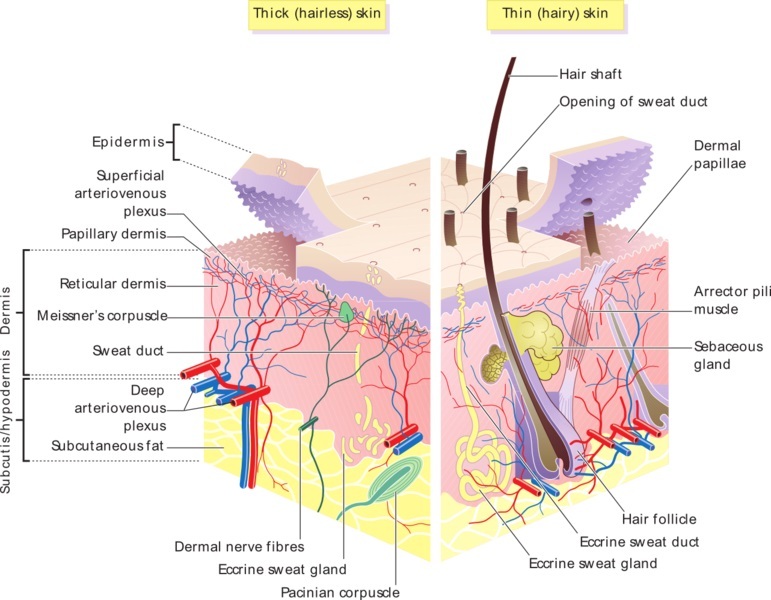 These are two types of skins in the body. They are classified based on the thickness of the epidermis. Furthermore, both types of skins are made up of three components: epidermis, dermis, and hypodermis. Also, the main function of both types of skins is to protect the internal organs of the body from dehydration, mechanical damage, and from pathogens. Thick skin is the skin from the palms and soles, so named because of its relatively thick epidermis, while thin skin is the skin from areas of the body other than the palms and soles, so named because of its relatively thin epidermis. Thus, this is the main difference between thick and thin skin. Thick skin occurs on the soles of feet, palms of hands, and the surface lining of the fingers and toes while thin skin covers the rest of the body. Moreover, thick skin has a thick epidermis with a thick Malpighian layer, granular layer, and very thick horny layer while thin skin has a thin epidermis with a thin Malpighian layer, granular layer, and very thin horny layer. Furthermore, thick skin has a Lucidium layer while thin skin lacks a Lucidium layer. Hence, this is also a difference between thick and thin skin. Besides, hair follicles is another difference between thick and thin skin. Thick skin lacks hair follicles while thin skin contains hair follicles. Also, while thick skin lacks arrector pili muscles, thin skin contains arrector pili muscles attached to hair follicles. Furthermore, thick skin contains a thin dermis while dermis of the thin skin is thick. Presence of sebaceous glands is also a difference between thick and thin skin. Thick skin does not contain sebaceous glands whereas thin skin contains sebaceous glands. Thick skin has a numerous, spirally-coiled sweat glands while thin skin has fewer sweat glands. One other difference between thick and thin skin is that the former has denser sensory receptors while the latter has sparser sensory receptors. Moreover, thick skin contains both ridges and furrows on the surface while thin skin lacks ridges and furrows on the surface. Another difference between thick and thin skin is that the former contains regular dermal papillae while the latter contains irregular dermal papillae. While thick skin is more restricted to mechanical abrasion, thin skin performs the other functions of the skin. Thick skin is the skin in the soles of feet, palms, and the surface lining of fingers and toes. Significantly, the epidermis of the thick skin is considerably thicker. Also, it contains a number of sweat glands, ridges, furrows, and regular dermal papillae. On the other hand, thin skin covers the rest of the parts of the body. It has a less thick epidermis. Also, it has sebaceous glands, hair follicles, and arrector pili muscles. Additionally, the main function of the thick skin is to protect the body from mechanical abrasion. Therefore, the main difference between thick and thin skin is their structure and function. 1. AlKhodari, Khaled. “Skin.” LinkedIn SlideShare, 2 May 2015, Available Here.